After suffering from Ankylosing Spondylitis for 12 years and being told there is no cure for this disease, I was desperate for some relief to my suffering. 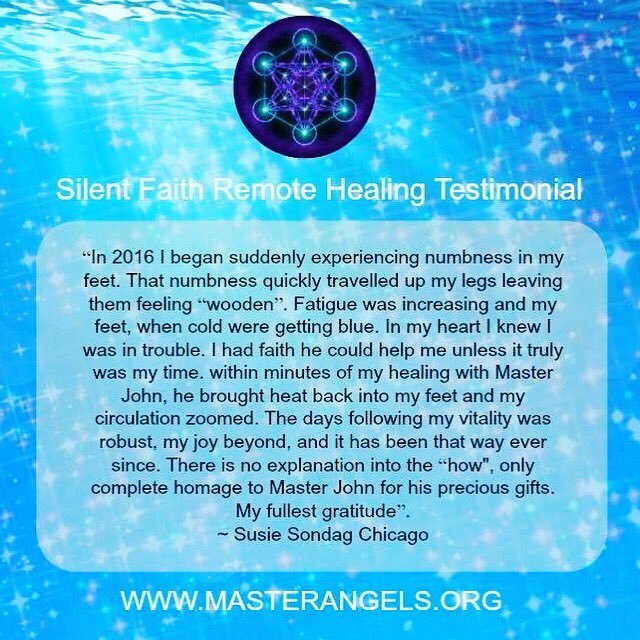 I requested a remote healing with Master John Douglas and the Master Angels. My pain has nearly all gone and I can now move again. My gratitude to Master John Douglas and the Master Angels for my healing. Forever Grateful! I just have to say, the remote healings are AMAZING. They quickly have become my favorite way to connect. I am someone who always likes to know when things are happening or what is happening, so at first this concept seemed challenging to me. The results are undeniable, though. I have seen some of my best improvements through remote healings. Anytime I have been hesitant about doing a remote healing for any reason, I immediately think how silly it was after. It’s truly unbelievable that kind of healing is available to us! Thank you Master John and the Master Angels! With love and gratitude. In 24 hours, I went from being extremely concerned about possibly having a very serious illness to being completely symptom-free. I will just use this word to describe what happened because it’s the only thing I can think of to explain what Master John’s remote healing was: a miracle. Recently, I had a Silent Remote Healing for a heart arrhythmia and palpitations that had been occurring for about a year and a half. My mother died from heart complications and I thought that I was genetically predisposed to the same issues. For two weeks prior to the Remote Healing, I felt a sense of urgency as to where this was all going. I read all the testimonials on the Silent Remote Healing page and knew that this was the way I needed to go. The healing was full of love and bliss and within an hour the arrhythmia and palpitations had stopped. I could hardly believe what had just happened. Thank you John and the loving Master Angels for my miracle! Dear CMA Support, I wanted to share my deep gratitude for the healing I experienced on the Silent Faith Remote session recently. I was instantly healed of a painful Shingles outbreak! I had just been diagnosed and was experiencing severe nerve pain in my right torso where my skin could not even be touched lightly without pain. I requested the Silent Faith Remote healing that night, and the next morning it was gone! I am yet again filled with gratitude for all the support from Master John and the Master Angels!! I am beyond my ability to describe in words the immense changes I’ve experienced since the introduction of the Karmic Mitigation Blessing. I requested one immediately when they became available and a second one about a week later for my deceased mother with whom I had a particularly difficult relationship. My childhood was bleak and mostly devoid of nurturance, hence, I’ve been working with John for about 8 years on the relief of a variety of mental, emotional, and subconscious challenges. Blessedly, I have had relatively few physical health concerns. After the two Karmic Mitigation Blessings, I have felt a HUGE releasing of long held patterns. I feel a sense of spaciousness, calm, freedom, and tremendous ease that I’ve not known before in any sustained way. This new state is stable and becoming my new normal. Striving to be good enough, over functioning, over use of my will to achieve things — all those things have faded into the background and an easeful surrender, a more loving approach, and a gentle humor have replaced those long held patterns. I feel filled up with love. I feel peaceful; happy and profoundly OK in myself. Thank you, John and the Master Angels. I remain forever grateful for this alternation in my being and my path. My 89-year old mother has been quickly going blind for 1.5 yrs. In Nov. 2016, the opthamologist saw a white spot in one of her eyes and told her it was going to get bigger, blocking her sight until she would only have peripheral vision. He reviewed it each month since then. She requested a Silent Remote Healing around May 18th for a healing of her eyes. Today, June 7th, she called me to say the doctor couldn’t find the white spot anymore! He looked for it but it wasn’t there anymore and her other eye looked better. Thank you! Our dog Miah received a positive Canine Parvovirus lab result and diagnosis from the Vet. We submitted the Silent Faith Remote Healing Request online midday, and by evening Miah’s symptoms had cleared!! Miah went from being lethargic with severe vomiting and diarrhea yesterday to being full of vitality and without the above symptoms today. 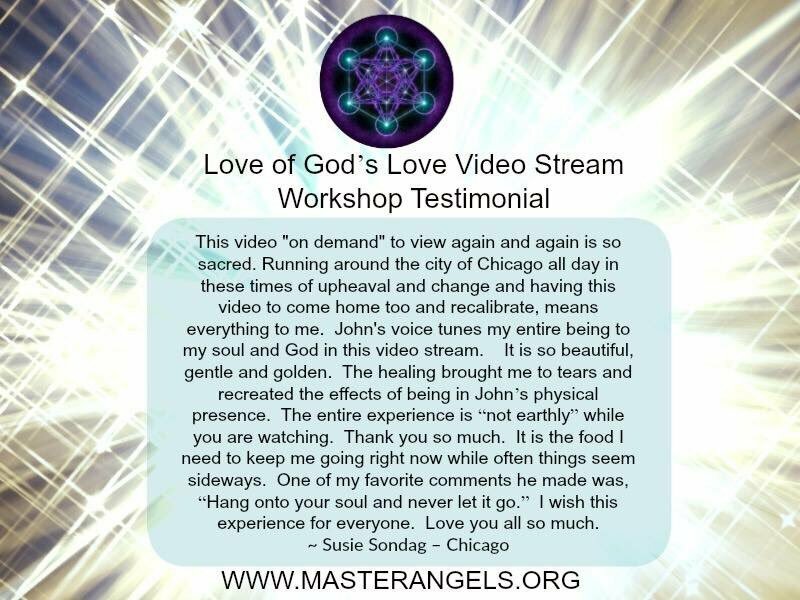 Sending all of our love and gratitude for this Intervention from Master John and the Master Angels. We are very attached to her and so very thankful to know that the virus has been cleared. Thank you from the bottom of our hearts! The morning after my remote healing, my double vision was gone. I got out of the hospital in 11 days instead of the 14 most people stay for my disorder, which was Miller Fisher syndrome. I improved so much, I was able to skip post-hospital rehab! Thank you, John!! I am delighted with the results of my request. I suffered recurrent herpes and so far after 8 weeks I have not had an attack. Previously, this has been a regular problem. I am indebted to John. Thanks a million! Thank you to Master John and Master Angels!!! Thank you for the miraculous healing, it was instantaneous… I mean, symptoms subsided moments after I wrote the request… it was received and granted right after I hit the “send” button. I don’t know how it works, but it definitely does! This is the second time for spontaneous healing through Silent Remote Healings. Both health issues were serious enough to get medical help if not for the Faith Healing. For me, the surrender it takes to desire and formulate a request is powerful, my Faith becomes greater, which is the supreme healing. Words can’t express my gratitude and love and hugs. Dear Master John Douglas, dear spiritual friends, on 29th of April I ordered a Silent Remote Healing for my husband. I observed a portion more wakefulness in him and less exhaustion. He himself feels more centered. And for myself I feel a great relief: more confidence, less pressure of responsibility for his situation. I got the impression, that not only the receiver [of the Silent Faith Remote] has the blessing from the higher realms, but also the person who takes an initiating role in ordering a Silent Remote Healing. Thank you so much for this Divine blessing! I am writing to express my gratitude, that is filled with love and appreciation, for the miraculous healing that I received several weeks ago. I had been experiencing severe abdominal pain with vomiting for over a week….I signed up for a remote healing. Then, several days later, I experienced my healing session. I felt very intense energies throughout my whole body and stomach area during the healing….It was the most intense energy healing that I have ever experienced. After the healing session had finished, I felt incredibly peaceful and as though I was floating in heaven…. Then the following day. I was blessed with another healing session with the Angels….Within a few minutes of experiencing the healing, the intense pain in my abdomen lifted and at the end of the session I heard ‘You will heal soon’….After this healing, I no longer had vomiting or pain in my abdomen and I healed very quickly…. 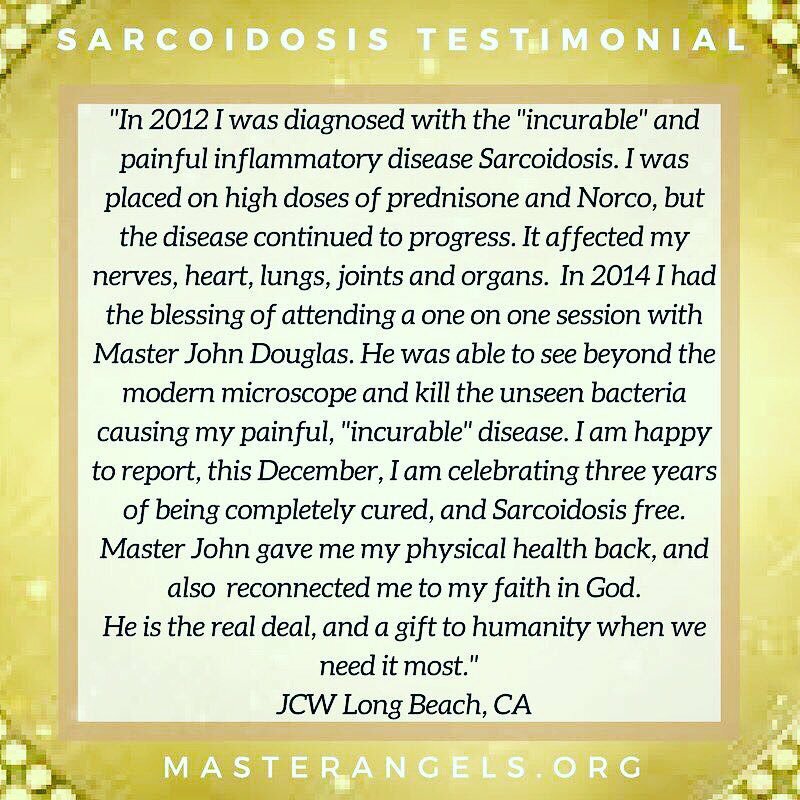 I wanted to thank you and the Master Healing Angels for offering me this miraculous healing….The Master Healing Angels were so loving and kind and I am so grateful to them for helping me and I am grateful to you, Master John, for facilitating this healing and allowing me to experience this miracle. During the days that I received the healing, I also received some greater awareness and insights about behavioral and emotional patterns that were creating suffering for me. This has really helped me to notice my responses and be able to start to change them. So, I was really lucky to receive this gift from the Angels as well. Sending you so much love, Master John, and lots of love to the Angels as well. Thank you so very much! Karmic Repair is the most powerful experience of the Divine that I have experienced in my entire life. I wanted to drop a quick note to say that I just downloaded Karmic Repair and just listened to it. Karmic Repair is the most powerful experience of the Divine that I have experienced in my entire life. My heart was overwhelmed at times with the pure energy from the Master Angels as John went through each blessing. I felt so connected to everything and everyone on the planet and experience much love for all. John has once again raised the bar! If the other CDs create a 4 dimensional effect, this is a 16 dimensional effect. I truly feel connected to the Lords of Karma and to the Spirit-Repair family in a way which is unprecedented – multidimensional beyond expression. I just wanted to share with you that I sat with my sister to share the “Spirit Repair” CD last evening. It was her first hearing of it since she just recently came to me to learn about John, and she had such a profound experience! Afterward, she said that John’s voice “sounds like God”. She said “they” spoke to her, telling her to move this way or that, and she could feel them touching her. I was sitting beside her during the meditation, and I could actually feel so many presences surrounding her, being very busy with what they were doing. So much so that I felt I had to lean away from her because I almost felt as though I was in the way. I was smiling the whole time because they were SO present with us. I’ve had digestive problems for 10 years. I’ve had my gallbladder removed. I’ve had procedures, taken supplements, changed my diet. Now, after just 24 hours of using the Food Repair Disc, my GI tract feels so much healthier and more comfortable. Burning, tightness, blockages–all gone! I’m using the disc on food, water, supplements and even on items like hand lotion, since they also get absorbed into my body. Thank you so much for this wonderful spiritual technology. I wish it for everyone. Using the Food Repair disc on unhealthy foods that I crave seems to deliver the psychological benefits of the food without the physical harm. And I lose the craving as well! Thank you all so much for this amazing healing technology. In short, combining the two things has resulted in an experience similar to being on a continuous extended meditation course and seems more powerful. As to Karmic Repair, besides feeling that the content is very profound and “right” and the after-feeling/intuition that it is powerful, beneficial, and important, my primary experiences relate to its connection to my meditation program (in this case TM). I have been led to use it twice a day, morning and evening, immediately continuing into my daily meditations. The process itself has meditation-like qualities and I have found myself running the gamut from very focused in repeating/following the dialog, to fading off and missing words and whole sentences, sometimes evening nodding off and “snapping” back to attention. But the greatest impact has been on my meditations: very much perceived to be deeper, more fixed at said depth, and with greater sensations of dissolution of deeper stress (including, literally, dissolution), all resulting in a powerful clarity of consciousness and energy at some point in every meditation, followed by a greater sense of separateness/something-else-present in activity. Even the siddhis portion of my meditation (for those familiar with this) is much more fixed and powerful. 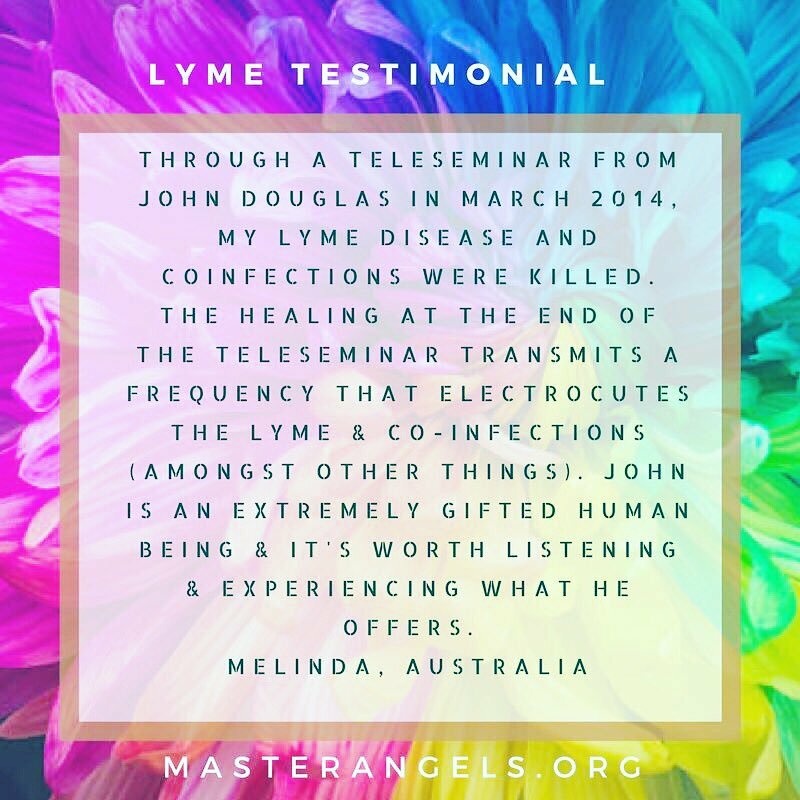 In short, combining the two things has resulted in an experience similar to being on a continuous extended meditation course and seems more powerful, as far as I can tell, even than when John personally worked on me or at any time using any other Spirit Repair tools. This does not feel like a random occurrence, as a couple of other meditators I know are trying this and experiencing similar results. It is my hope that John will endorse this and explain it, and that it will be recommended for all meditators and will produce a rapid positive effect. All blessings to John, the Master Angels, and the Spirit Repair family. I want to send you my deepest thanks. I came to a beginning workshop this past week. The pragmatic assessment I received of a present medical condition I face made perfect sense, and in applying the measures recommended. Also, there is also an irksome longstanding medical issue that has improved so dramatically since the seminar that I had to let you know about it. I have literally spent thousands of dollars to almost no avail trying to address a situation that Master John fixed instantly. I am inherently someone who needs to see proof and tangible results. Laudation and talk of the spiritual wonder of a teaching or practice does little for me without them. These results are tangible, and were derived at a tiny fraction of the costs I have incurred elsewhere. The knowledge in the lecture was revolutionary, and yet, on second thought, so simple that it is remarkable how much is overlooked in both Eastern and Western medicine. Again, my deepest, deepest gratitude, and I look forward to another seminar. Namaste and then some! For many years, I had searched for a cure for the HIV I had been hosting, and had investigated a variety of healing modalities, hoping I would find the answer…. So when I was presented with the opportunity to have a complete and immediate healing from the Master Angels, it seemed almost too good to be true. Could such a miraculous healing actual happen through something so direct but so simple? My mind wanted to be skeptical, as I had seen and experienced other supposed healing remedies that never really eliminated any of my ongoing symptoms, much less rid my body of the virus. When I was told that the Master Angels had killed all the cells in my body infected with HIV, in addition to a few other viruses, I was practically speechless. For several days, I just sat with this awareness, letting the enormity of what had happened sink in…. When the second round of blood tests showed a sharp drop in my viral load, it was a confirmation that the medical tests were now reflecting the truth of the healing I had received. Since then, my energy levels have continued to improve and the blood tests continue to show a diminishing viral presence. This healing journey has meant not only renewed physical health and strength, but is manifesting as a true quantum leap in my spiritual growth and evolution. 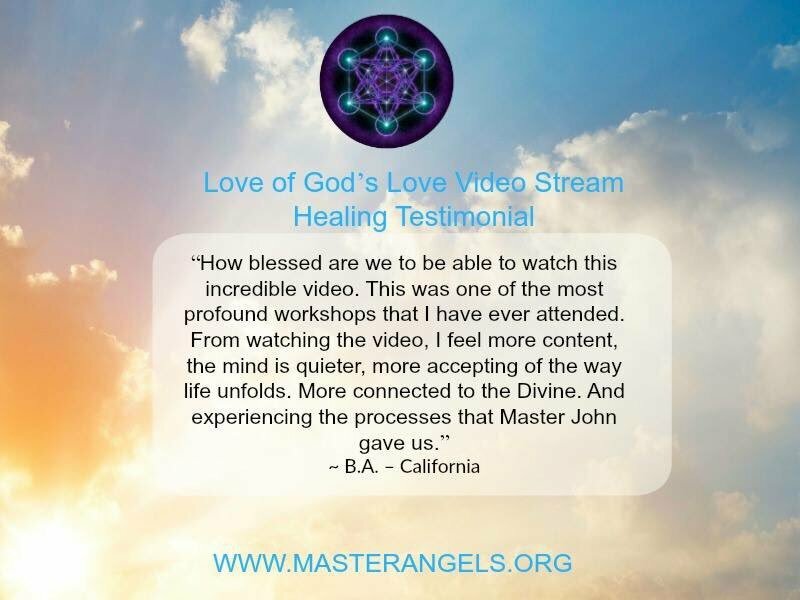 For this gift, I have only the deepest respect, love and gratitude for Master John and his practitioners, and their divine connection to the Master Angels who are bringing such transformational healings and blessings to those ready to receive them! During his visit to Fairfield in October, Master John confirmed the diagnosis of osteoporosis I had received that was based on a full Dexa bone scan in August. Master John found an accumulation of pesticides in my bones, especially my right forearm that may have contributed to the problem (after October I was also diagnosed with low testosterone). After his treatment I faithfully followed his advice on calcium/magnesium supplements and used location-repair, spirit-repair and health-repair daily. Amazingly, a follow-up test for osteoporosis a few weeks ago found no evidence of osteoporosis! My T-score was minus 2.57 in August based on the Dexa scan, indicating serious osteoporosis. However my T-score in the follow up test was an unbelievable +0.9 based on an ultrasound test of the bones in the heel, indicating above average bone strength for someone in their early 20’s (I am 67)! The ultrasound test is a less comprehensive test than the Dexa scan but the results of the ultrasound test are said to give results within 1-2% of those obtained from a full Dexa scan. This is a truly miraculous transformation. I am deeply grateful. Thank you!! I was blessed to have a consult with John about a year ago in March as part of the Multiple Sclerosis Study. I wanted to let you know that I had my annual MRI’s done and for the first time, since being diagnosed by five different Neurologists in 2006, I’m showing ZERO signs of disease progression! I absolutely know my consult with John and continued use of the CD’s is the reason for this. I’m still doing both Eastern and Western med treatments, but nothing that alters my immune system and I’ve cut back on some meds. This is also the first year that I have not needed even one round of steroids! One reason that this is so unbelievably significant I feel is that in July I lost my only sibling, my sister who took her life. It has been tremendously difficult for my whole family of meditators. I feel like we are living on Spirit Repair somedays :). Something that emotional in the past would have created terrible issues for my body, this year NONE. I make great use of the CD’s. I’m thrilled to find out that John is coming to Tampa and my mom and I are planning to sign up for the classes. I am very grateful to Master John for literally saving my life. I came to a seminar for general growth and so my husband could get some help with digestive issues. But I kept having the strong feeling I really needed to talk to Master John, so at the very end I went up and mentioned to him that my father had had Parkinson’s, and that I had been feeling a strange vibration, not yet manifested to real trembling, throughout my body along with some unusual weakness in my limbs. Master John gave me a look and said, “You have just saved your life. You should run, not walk to get started on [Parasite Repair].” I followed his instructions and the incipient trembling and weakness have disappeared almost completely, and even the slightest remainders are fading. I can almost feel my nerve endings and cells getting healthier and healthier. I have just started doing the Karmic Repair at the set time daily, and hope doing that in some small measure will help to repay for the incredible gift I have been given of avoiding a serious degenerative health situation. I have had chronic neck/shoulder pain for as long as I can remember. I didn’t put it together until he said something, but it has been ever since I started taking medication about 20 years ago and MJD said the pain was due to drug residues on top of my pain receptors. I stopped the meds 5 years ago, but some residues stayed in the body. Well, I told him about that pain and in 2 minutes it was gone. Amazing. It had gone from mild to horrendous, annoying to debilitating, requiring pain medication, chiropractic and bodywork. I’ll keep you posted if it continues like this long term, but it’s been a few days and it feels like I will continue to be pain free. Please send MJD my love and appreciation for the changes in me and for helping my father long distance and for spending so much time with all of us from Farifield. He is a wonderful man and very angelic. For the latest videos, visit our Master Angels YouTube Channel. Subscribe to Master Angels Facebook, Instagram, and YouTube channels for inspiration and info!